Reviewing Finnish hack hillbilly crew Steve’n’Seagulls may have been a risky proposition a year ago. The band does country covers of famous heavy metal/hard rock songs, but being that the songs they covered on their debut Farm Machine were bona fide heavy metal cornerstones and the fact that Steve’n’Seagulls are signed to a metal label made review of Farm Machine legit. Farm Machine resulting in widespread (including internet) success garnered Steve’n’Seagulls an extended tour, and the State of Colorado even declared one day in September 2015 “the Steve’n’Seagulls” day. 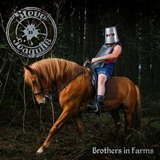 From there the fire to do more continues to burn and the list of songs to cover apparently has not dried up, so the Finns are back with the follow-up Brothers in Farms. Since I have provided my opinion on Farm Machine, I have the obligation to do the same for Brothers in Farms, but this apparently is going to be my last visit to the land of country and bluegrass for a while. I have said it before, and will repeat it again. Country is just not my thing at all, yet I open my mind completely to how versatile music in general can be providing a totally different twist by converting one genre originals into another genre cover. There is no question that Steve’n’Seagulls are the masters of that feel. Where one can see riffs, distorted guitars and heaviness, they see mandolin runs, all kinds of native percussion playing and whole lot of fun. From there, once you recognize the original, it is up to you whether you accept or reject the interpretation. Whereas on Farm Machine I was generally more pro than con (with a few notable exceptions, Holy Diver being one), on Brothers in Farms the problems that bugged me on its predecessor got exacerbated. First and foremost, the Finns choice of songs to cover shifted further away from heavy metal into hard rock territory. Instead of Dio we now have a double dose of Guns N’Roses, Nirvana, Steppenwolf and Foo Fighters (?). The vocals, not rough and tumble in the first place, got even softer, too singy, and definitely not redneck tough. And finally, something has happened to the sound, where, consciously or not, the Finns have strongly turned out their bottom end, making double and contrabass a lot less audible in the mix. So my main sum and substance impression of this album were soft sound covers of the songs I did not much care for in the first place. From here I can offer up a quick discussion of the individual songs, and the things I learned from Steve’n’Seagulls take on them, some positive and some not so much. Making Aces High sound like samba could be borderline acceptable, but twisting Sad but True from personal struggles with addiction and inner being dark side to another stroll in the park abomination is not. If I did not know what was being covered or have not heard the lyrics I would not recognize this piece its mood being so twisted. Nightwish’s Wishmaster verse is being made completely unrecognizable either, but there apparently is a lot of Celtic overtone in that track I did not know about. The mandolin interpretation of the main riff is OK, while some moments sound more like Gary Moore than the symphonic majestic Nightwish. You Could Be Mine (Guns N’ Roses) and Self Esteem (The Offspring) can be made into a rhythmic fun, but Fill Up the Tank and It’s a Long Way to the Top (If You Wanna Rock’n’Roll) prove to me one more time why country sound is so one-liner and repetitively boring. Symphony of Destruction (Megadeth) has at least some tension in it, and twangy sounding guitar is a good thing for that piece. The best track, by far, was Deep Purple’s Burn. Turns out this song is tailor made for bluegrass, high Gillan’s voice and Lord’s keyboards leads well reflected by Steve’n’Seagulls capturing the adventurous spirit, yet sticking to their own devices. The band’s first own song Out in the Fields has more oomph and melodic hooks in it than they were able to convey in many an original here, which shows Steve’n’Seagulls potential, but paradoxically the band would kill their own shtick if they start writing songs instead of finding tunes to cover. As much criticism as I voiced above, I can still maintain that Brothers in Farms is 45 min of guaranteed relaxing listen, as well as hope and lesson to many country/bluegrass young artists out there that learning their roots is something that will take you further in your careers. Rock’n’roll history will beat out country mind-numbing tediousness every time.